RTV (Room Temperature Vulcanising) Silicones are products that exhibits very little shrinkage as it is 100% solid system. RTV Silicone Sealants has reasonably good adhesion on metals like mild steel, aluminium and also on painted sheet metals. It also has good adhesion on glass & ceramic. This sealant after curing becomes rubbery and hence exhibits excellent resistance towards ozone, saline water and polar solvents. RTV Silicone Sealants resists ageing, weathering and thermal cycles without hardening, shrinking or cracking. This sealant finding use in number of industrial sealing, gasketing, potting and insulating applications. There are single component RTV silicone sealants and 2 component silicone sealants depending on the applications. Anabond - 652 is a thermally conductive but electrically insulating system. It will not harden or dry out or melt even after 1000 hours @ 200 ºC with good dielectric properties. Anabond RTV sealants are single component room temperature vulcanising products that cure in the presence of moisture to form tough rubber like material which bonds and seals parts. They are used as a Form-In-Place gasket in the engineering industry to replace gaskets. As they have excellent gap filling ability, they can be effectively used in flanges with larger gaps like a sheet metal covers, oil sumps etc. 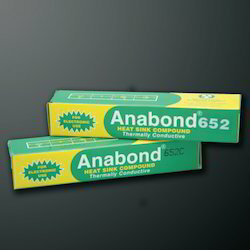 Anabond RTV sealants are used by automotive industry to ensure efficiency in their vehicles. They are also used in heavy engineering industries where high temperatures are encountered. Used for sealing, bonding, potting and gasketing in Automotive industries, electrical and electronic industries and construction industry. Anabond Two Component RTV Silicone is a two component sealant that cures in the presence of moisture to form a tough rubber like material that prevents ingress of moisture and seals the components on which it is used. They are easy to apply and remove. Components sealed with a typical sealant like Anabond 909 becomes resistant to water, oils, alcohol and most other chemical substances. Used for potting PCB’s in appliance, automotive and other electronic industries.